SafetyTats are temporary tattoos designed to keep kids safe when they get lost. The SafetyTats Quick Stick Write-On! pack features 18 temporary tattoos with blank spaces to write in a cell phone number or other safety information. Once customized, the SafetyTats can be quickly and painlessly applied to a child’s skin without water. The tattoos’ vibrant colors are made to last up to two weeks. SafetyTats are ideal for visits to public places like zoos, malls or amusement parks. — Maricris of Zen Mama Ventures tested SafetyTats with her daughter at a Chinese New Year festival. During the hustle and bustle of the celebration, Maricris felt assured knowing that if she wondered off, her SafetyTat would help get her back safe and sound. Written by a pediatrician, the Dr. Hippo book series teaches kids about common childhood illnesses like ear infections, colds and sore throats. Each story features a friendly animal family that is affected by one of the illnesses and goes to the reassuring Dr. Hippo for help. The stories are written so that kids learn how they can keep themselves from getting sick and that doctors are friendly people who just want to help them get better. The Dr. Hippo books also include a Parent’s Guide with common questions about the illness featured in the story. — Guessing All the Way’s Laurie reports that the books were popular with her kids, even inspiring her nephew to share what he had learned with his friends. Laurie cites the laminated Parent Guide as the book’s best feature. Kidorable describes its Fairy Umbrella as an “imagination tent,” an apt description for such a delightful and functional product. This whimsical, kid-sized umbrella features a beautiful fairy print, a spiral handle, ruffled edges and magical fairy wings. Kids can pair the Fairy Umbrella with matching Fairy Rain Coats, Rain Boots, Backpack or any of Kidorable’s coordinating rainy day items. — Cinde, The Freebie Fairy, recounted how her daughter was a big hit at school with her Kidorable fairy umbrella: “The girls all wanted to touch the wings!” Cinde praised the company’s attention to detail and was so enamored with the product line that she wished the items came in adult sizes. — Stefany of To Be Thode reviewed the Kidorable Frog Rain Boots, Umbrella and Rain Coat. She found them all to be top quality products sure to last a long time. — Cindi Matthews of Moomette’s Magnificents called the Kidorable Rain Coats she reviewed “absolutely fun.” She was especially fond of the easy-open snaps and the reflective coating the coats have to make kids visible at night. BRIK-A-BLOK-46 by BRIK-A-BLOK TOYS INC.
Other products from BRIK-A-BLOK TOYS INC. 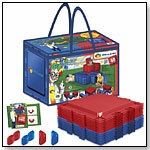 The 16" x 16" polymer panels are designed so that kids can safely build three-dimensional structures kids. Launch date: March 2009. — Dave Taylor of The Attachment Parenting Blog said Brik-A-Blok was a huge hit with his kids (ages 6 and 9). He noted that his kids’ constructions took up a great deal of space, with Brik-A-Blok tunnels stretching throughout their home. Taylor called the building system “fabulously cool,” though he lamented the high price tag. — Brik-A-blok was the "most funnest review ever!" for She Scribes’ Kimberley and her son. Her kids enjoyed creating new structures with the versatile panels. However, Kimberley also pointed out the large amount of space needed for the toy as well as the panels’ inability to support much weight. •Watch Videos From Toy Fair 2010! •Video Interview: Toy Fair Trends Get All "A's"